Bali’s charms impinge in earnest the moment you leave the one-street towns, bar strips and plasticky souvenir joints, and turn either inwards towards the green-draped valleys and terraced rice fields, or head towards the coast. The newly opened Alila Seminyak takes its cues from its perfect beachfront location a short walk from Seminyak town’s hippy slash hipster collection of smart restaurants, art galleries, itsy local spas, and surf-shops. 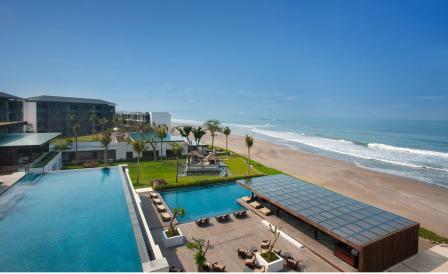 As a group, Alila flies its eco-friendly flag high, eschewing air-conditioning for sea-breezes and natural ventilation. Brief in hand, architect Gaurang Khemka and his team at Singapore firm URBNarc have created a secret garden amidst the hustle and bustle of Seminyak, laying out the resort’s 240 rooms around a sequence of naturally shaded public spaces that are dominated by four swimming pools, one of which literally sits atop the entire length of the restaurant. The low-slung green-roofed four-storey buildings are clad in vertical green walls, and landscaped terraces courtesy of Gaurang, alongwith Chang huai-yan and Lee Berlin of the deliciously named Singapore-based outfit, Salad Dressing. For our money, the best rooms in the house front the ocean, the floor to ceiling glass doors sliding open to uninterrupted views of white-foamed surf. Less sedentary types may enjoy a spin around town in the resort’s vintage Volkswagon Kombi, but between a lomi-lomi treatment in the fragrant, mood-lit spa, beach yoga, and a chilled cocktail from the beach bar, why would you?